Benett-Stanford dabbled in filmmaking for a short time only. Born into a Wiltshire landed family, he was educated at Eton before beginning a career in the army in 1888, seeing active service on the North-West frontier in the Tirah campaign (as did Walter Beevor). 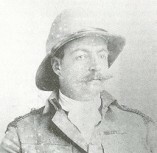 His next service assignment was the Sudan expedition of 1898, where he acted as war correspondent for the Western Morning News, and, like Frederic Villiers was present at the battle of Omdurman. Before leaving Britain he had managed to obtain a film camera from Prestwich, and with this he filmed the British commander, Kitchener, as well as a view of the Grenadier Guards fixing bayonets and marching off on the day before the battle. This brief film had a huge success, being the only film taken at Omdurman, a notable British military victory. The following year he took a couple of films on Madeira, where the family had a house, as well as a variety of farmyard and other scenes. When the Boer War broke out, Benett-Stanford was the first man with a film camera to set off for the front, leaving Britain on 7 October 1899. By November he was at Belmont with Lord Methuen's force and filming at the Orange River, and on 8 December he filmed troops crossing the Modder River and other military scenes. These films were released by the Warwick Trading Company in January 1900; the same month Benett-Stanford's career as a camera operator seems to have ended, when Joseph Rosenthal took over as Warwick's principal Boer War cameraman. After the war Benett-Stanford went back to the life of a soldier and gentleman, serving in the First World War, and running the family estate in Wiltshire. In later life he is described as increasingly resembling Colonel Blimp, took up yachting and developed a penchant for practical jokes; he is also reputed to have exercised his rights of 'droit de seigneur' among the local girls. He clearly did not think that his dabblings in cinematography were of any great moment, failing to mention them either in his description of the battle of Omdurman or in his manuscript autobiography.